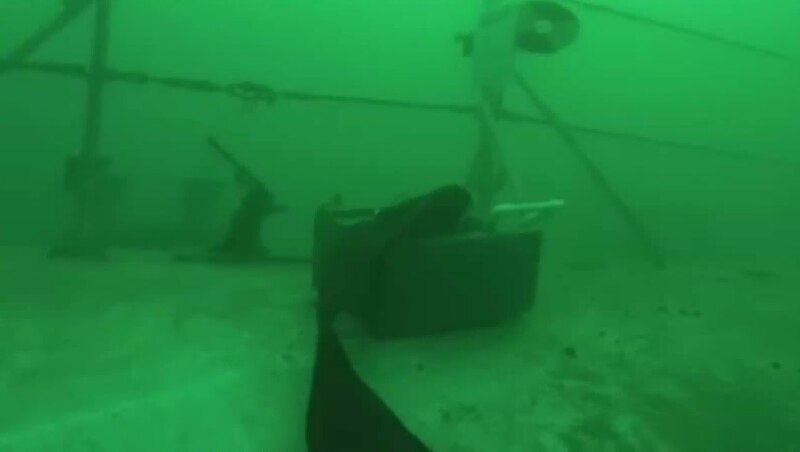 Since the HMCS Annapolis went down not long ago, there was a lot of interest in chronicling and monitoring the growth of life on this newly created artificial reef. 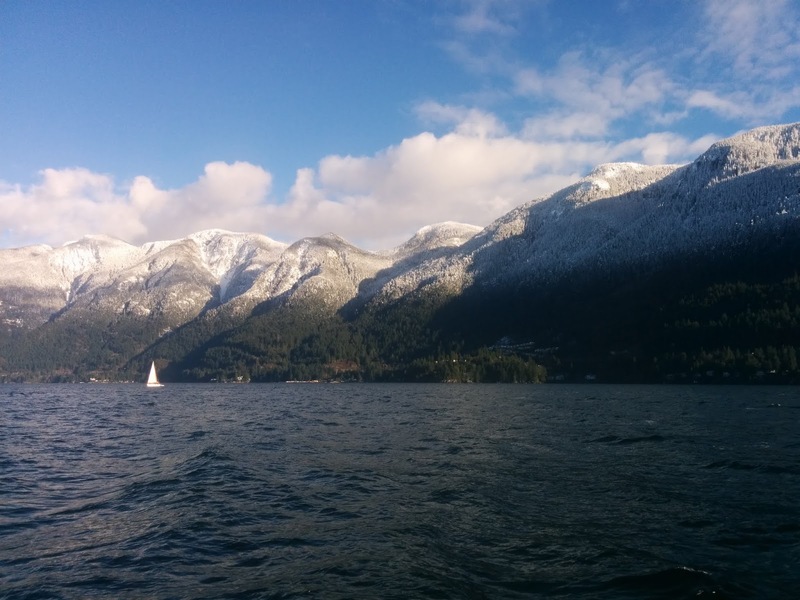 Dave Williams created the Halkett Bay project under the Global Underwater Explorers Project Baseline to help with this. The clock was ticking to start the work! The sooner the monitoring started, the better the historical view. It would be very important to get all the data possible to continue to help prove the success of artificial reefs. With a baseline established, comparisons could be made as time went on which would help other artificial reef projects in the future. It was always easy to point to the life on the HMCS Saskatchewan and other wrecks, but governments and other organizations need documented change over time to influence polices and practices. The Vancouver Aquarium also started a similar project called the Annapolis Biodiversity Index Study. Heather and I attended a meeting not long ago hosted by the Aquarium to go over this project. They used the term "species recruitment", which was just a fancy way of saying life was moving in. Howie and Doug of the ARSBC were there, and Doug did a presentation of photos of the Annapolis high-lighting areas where studies could go. The Aquarium wanted as much photo and video evidence as possible over time, and these could be submitted via the project page. Donna at the Aquarium had volunteered to extract species information and add it to their database. There was a surprising amount in there already! Most of the additional discussion focused on how to make it easier for citizen science divers to gather data using established photo stations and procedures. One issue was to provide as much information as possible to divers so they could easily report their position on the ship when submitting data. Anyway, enough of that and on to the diving! I didn't get a lot of video from the day, but here was what I got. 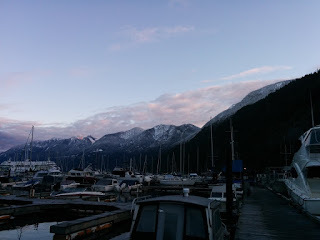 Horseshoe Bay greeted us nice and early. The weather was relatively sunny and it wasn't raining or snowing. The mountains were sure pretty! Once again, we were going on the Topline of Sea Dragon Charters. 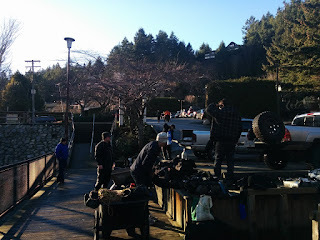 We met at the winter dock and set about unloading. There were quite a few people on the boat. Featured in this picture was Evan, Josh and Dave. As we were heading out, I got this panorama from the top of the Topline. I thought to get dressed up there, which started out a good idea, but I quickly became very wet as we were hitting a lot of waves. It was motivation to get zipped up fast! You could see how rough the ride out was from the video above. I got water droplets on my GoPro lens and used the "tongue lick" technique to get rid of them. It worked pretty well! It was certainly easier then trying to dry the lens off. I included a first-hand look in the "out-takes" video at the bottom of this. On board were about 14 divers total. An incomplete list was Josh, Dave, John, Evan, Kevin, Manfred, Tod, Sam and myself. Brian Caron was also along, who I had met at the Aquarium fish ID lectures. Apologies for not getting a full roll call! My plan had been to do some scootering with John and Evan. Unfortunately Evan's dry suit neck seal failed and he was out for the day. He noticed it before the dive, and ended up trying anyway, but it was leaking too much. It was too bad, because his dry suit had just come back from the shop after getting the boot repaired. This left just me and John on team scooter. One of the other recreation teams was diving in wetsuits, and they didn't last long. The younger diver nearly got hypothermia. It was definitely winter diving season! Dave had two stations to deploy. One of them would be on the sea floor away from the ship. This required something to tie to, so he had a concrete block. The first order of business was to drop that block over the side and get it somewhere near to where we wanted it. We learned a lot on this trip, mostly things that didn't work so well! First was dropping the block. The idea was to drop it along with a line to the side of the ship, then locate it and move it into position. The problem was that the float that was attached came loose, and the block landed on the ship. Whoops. Still, it was a warship and pretty sturdy so it wasn't too bad. On the first dive, Josh and Dave would position station A on the ship and John and myself would locate the block and use a large SMB to float it and move it into position. I heard later that the float for station A imploded on the descent with quite a pop. John and I came across the fragments during our dive. It was also challenging finding the concrete block. It should have beeen on the sea floor on the starboard side of the center mooring line. The visibility was about 20 feet so you couldn't see far. John and I scootered up and down the starboard side twice without finding anything. It wasn't until we came up to the deck that we found the block sitting on the ship. I inflated the SMB but it wasn't enough to float the block. It wasn't actually a lift bag, but one of the large 6 foot SMBs. Chalk something else up to learning: verify the mass of your object and make sure you have adequate lift! We didn't have much choice and ended up pushing it over the side. John tried a few more times to add more gas to the SMB but to no avail. We left it on the bottom with the intention of fixing it on the next dive. The rest of our first dive was excellent. We toured the ship, scootered through some swim throughs and just had a good dive. I tried to get through the back door of the hangar bay, but couldn't make it with my stage. I vowed to lose some weight in the New Year! Back on the surface we regrouped and debriefed. Dave and Josh would recover the line attached to the block and John and I would get the SMB. After some hot soup it was back into the water. Captain Kevin wanted to get back ASAP as the wind was kicking up. In the rush, I forgot to check my suit inflation bottle. It was actually empty since I used a large amount of it to inflate the SMB on the first dive. A good reminder to always check everything, even if rushing. On the bright side, it provided good practice swapping an LPI inflator to my suit and back. John and I made a B-line to station B, but found that Josh and Dave had already recovered the SMB and started on the line. We would find out later that the bigger SMB got away from them and ended up getting lost. Sorry Evan (it was his SMB)! Evan was the unlucky one on this dive trip for sure. With our task taken care of, I proceeded to get some video of the ship. My goal was to get extra footage for the Vancouver Aquarium for their Annapolis Biodiversity Index Study. We spent time videoing the growth on the windows of the flying bridge, a large gelatinous mass in one of the boxes on the deck, a juvenile quillback rockfish, and shrimp on the rear of the hangar bay. I made sure to get video of non-growing things, as that was important too. It was important to see what was not there, so that later as things grew, you could compare back. I remember the Aquarium saying specifically that documentation of no life was just as important as life! We were treated to a spectacular view of the mountains on the trip back home. To top off such a nice day, we met for food and drinks afterward. There were many stories and fun times shared. A very successful day, and a good start to the ongoing effort to document the growth of life on our newest artificial reef! Finally, I put together some humorous out-takes from the dive video.